Yet again, gay activists have pointed a wagging judgmental finger, telling us one thing but doing another. Recently, there have been two reality TV stars that have come out as not supportive of homosexuality, sparking a wave of political outrage. In December, the TV network A&E suspended Phil Robertson after GLAAD protested his comments regarding homosexuality in an interview with GQ magazine. Then in early January, Celebrity Big Brother UK “reprimanded” heavyweight boxing champ Evander Holyfield for voicing his view of homosexuality to a fellow contestant, Luisa Zissman. While discussing the number of openly gay men in the world of boxing, Holyfield stated that being gay was not normal and that it was something that could be changed. In both instances, the comments were made in a respectful way without apology, but not good enough for GLAAD, the gay rights keeper of the tolerance flame. These are only the latest instances of GLAAD’s oppression of anyone who disagrees with them while simultaneously demanding that everyone else be tolerant. In 2012, GLAAD published what it dubbed the Commentator’s Accountability Project. Although officially not intended to get commentators off the air, the character assassination attempt is quite apparent. Then in 2013, GLAAD reviled National Geographic for not including a disclaimer regarding the Boy Scout’s policy on homosexuality before their reality TV show, Are You Tougher Than A Boy Scout. Apparently, being respectful and non-judgmental is no longer considered to be tolerant. According to GLAAD’s behavior, tolerance is not disagreeing with their position, period. Seems to me the roles have reversed. Now it is the “oppressed minority” who has become the oppressor, trying to silence any form of dissent from their world view. Thankfully, all is not lost. In the days and weeks following his suspension, Phil Robertson received a lot of grassroots support, especially through social media, and even saw a significant rise in book sales. A&E eventually reinstated Phil, reportedly as a financial move to keep viewership, citing the usual disclaimer about the network not endorsing the views of any one particular actor. Although vocal support for Evander Holyfield was not as strong as it was for Robertson, he has had people step into his corner. Mostly notably, the Atlanta based Overcomers Network, committed to promoting peer to peer empowerment and sexual holiness, especially when it comes to EXLGBT issues. 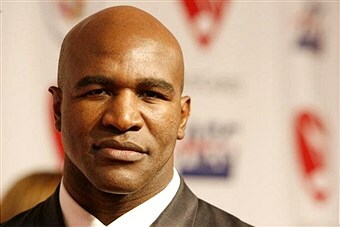 The Network released a statement saying that Holyfield respectfully told the honest truth and pulled no punches. Nathan Ruark is Secretary of Voice of the Voiceless and resides in Grand Rapids, MI. He carries the rank of Specialist in the Michigan Army National Guard where he works as a radar repairer. He holds a Bachelors of Science degree in Psychology from Grand Valley State University. He has volunteered with Sexual Orientation Change Effort (SOCE) programs for the previous 10 years and publicly advocated for SOCE rights for the past 4 years. This entry was posted in Evander Holyfield, GLAAD, inverted tolerance, Political Correctness, Uncategorized and tagged Big Brother UK, boxing, Luisa Zissman, Overcomers Network, Phil Robertson, reality shows on 2014-01-15 by VoV Contributor.